We invite you to the first international seminar dedicated to Professor Eleonora Barbieri Masini, former President of World Futures Studies Federation (WFSF). The seminar is for you who wish to discuss Women and Futures in a special and ecological travel setting on the Baltic Sea. This invitation is open to all interested in Women and Futures as well as issues on Sustainable Futures. Particularly this seminar is arranged for futurists, futures researchers and students wishing to engage in interactive discussions on the topics. We offer you a special day to stimulate and to be stimulated by your futures research colleagues and strengthen your networks. International inspirations and the unique Baltic Sea horizons are offered for the multicultural participants during this “Futuristic Voyage” onboard M/S Viking Grace. New horizons are searching for solutions for Wicked Problems during this “Futuristic Voyage”: one alternative “wave” is looking at new directions for futures research and another “wave” is looking at solutions for the futures movement. Panel of the session moderators (tbc): Introduction to the topics of “Women and Futures”, and aims for the interactive Roundtable discussions. In the beginning of the session participants will create a number of topics they deem relevant. Discussion space will be designated for each topic. In the Roundtable sessions the participants can present views based on their own knowledge, short research reports, as well as to share insights and research experiences in a multidisciplinary setting. The purpose of “Open Space Technology” is to draw out knowledge and experiences that you are passionate about that you have studied, researched, written or experienced on the topics above. The outcomes of the Roundtables can frame contributions for further research activities within WSFS, FFRC, FFSS, generate new research themes for scientific articles and other publications. The individual suggesting the topic will moderate their own topics and will be responsible for reporting back to other sessions in the seminar, and afterwards to WFSF and its membership. Conclusions: Crossing the “waves” of the Seminar Sessions enables the participants an opportunity to share the outcomes and suggestions with each other for further development. Call for Abstracts is open until 3 May on research papers, posters, projects and presentations in various fields of “Women and Futures”. The “early bird” notification of acceptance will be send authors starting on April, 2015. Abstracts should be in line with the abstract instructions for conference. Please submit your abstract to the seminar organisers via email futuresconference(a)utu.fi with a note in the subject field: “Masini Seminar abstract”. The seminar is free of charge. The fees quoted at registration are to cover the cost of the fare and breakfast on each leg of the journey. Further details on the cruise prices are available on the WFSF website. By participating in the Pre-Conference all your travel arrangements from Stockholm to Turku, and return, will be arranged for you. Travel is via the environmentally responsible Viking Lines ship M/S Grace. Both the cost and environmental impact is less than travel by air. Flying directly into Turku requires changing planes in Helsinki and the ticket is expensive. By flying directly to Stockholm, Sweden international flights can be less expensive. Turku’s location provides an opportunity for a splendid trip aboard the luxurious and thoughtfully designed Viking Grace, which sails through two archipelagoes (Swedish and Finnish) to arrive in Turku the night before the full conference begins. The voyage is from 7:30 am to 19:50 pm, Wednesday 10 June, giving us plenty of time to tackle big subjects and get to know one another better. Finnish participants must book their cruise directly via Viking Line online booking system. Choose M/S Grace cruise in the evening of Tuesday 9 June (fyi: the most affordable cabin is “Inside Piccolo”). The seminar will take place on the return trip (Sto-Tku) on M/S Grace departing Stockholm 07:45 Wednesday 10 June. Registration for the seminar has ended. If you still want to participate, we kindly ask you to book your cruise (information above) and after that send an email to: visionscentret(a)framtidsbygget.se – thank you! Payment no later than 3 May 2015 via the WFSF website, using the Donate button. 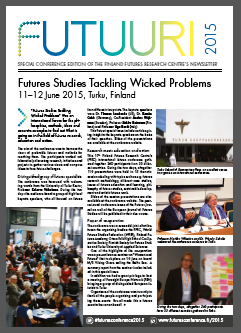 The seminar participants are most welcome to join the futures conference “Futures Studies Tackling Wicked Problems” in Turku on 11-12 June. If you are interested in joining the conference, please note that the early bird registration fee is valid until 31 March 2015.